June 28, 2016 - Cornell Dubilier has introduced the world’s only hermetic aluminum electrolytic capacitor with a glass-to-metal seal and it is now available through franchise distributor New Yorker Electronics. With no dry-out mechanism and high capacitance retention at low temperatures, this technology is poised to replace banks of costly wet tantalum capacitors. 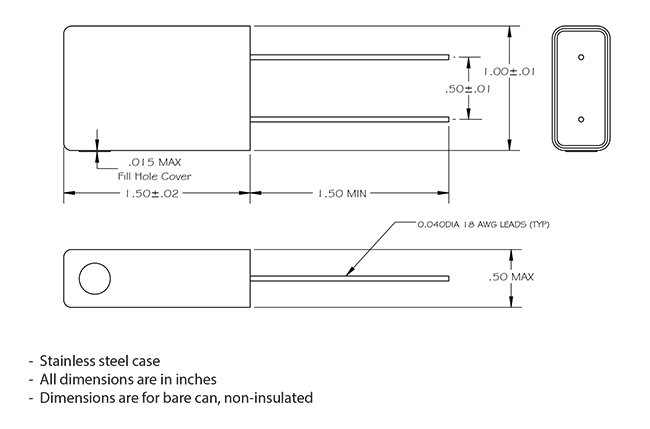 The new Cornell Slimpack, type MLSH, is the first in a series of hermetically sealed aluminum electrolytic capacitors that the company plans to introduce over the next several months. With its glass-to-metal seal that prevents dry-out, this capacitor technology has extraordinarily long life in order to meet the most demanding military and aerospace applications. The hermetic Slimpack is a spin-off of the non-hermetic Flatpack series that New Yorker Electronics has been supplying to military and aerospace end-users for more than 20 years. Cornell Dubilier expects this technology to replace parallel and series banks of wet tantalum capacitors for new and existing designs, especially where bulk storage is paramount. 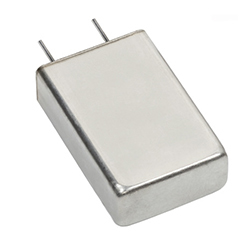 According to the manufacturer, the MLSH Slimpack (measuring 1.0in x 1.5in x 0.5in) will weigh less and have more capacitance than a parallel bank of three or more wet tantalum capacitors as if at -55°C. High capacitance at low temperature is a key requirement for power supplies used in military and aerospace applications. In addition to its performance advantages at low temperature, the technology is expected to have a significantly lower cost than a comparable bank of wet tantalum capacitors. New Yorker Electronics is a franchise distributor for Cornell Dubilier carrying the MLSG Flatpack Ruggedized Flat Aluminum Electrolytic Capacitor as well as its full line of Aluminum Electrolytic Capacitors, AC Oil Filled Capacitors, DC Oil Filled Capacitors, Film Capacitors, MICA Capacitors, Ultracapacitors, Surface Mount Capacitors, Aluminum Polymer Capacitors, Supercapacitors, plus Capacitor Hardware and Capacitor Kits.